In researching the technologies and tools that I use when developing digital content I’ve come across multiple discussions about what’s the best way to create HTML for X application (ebooks, web, transforming into other formats and any number of ideas. Some people think that HTML is perfect for everyone to write, regardless of experience and comfort with the technology. We forget that HTML now is very different to HTML as it was originally created. HTML —which is short for HyperText Markup Language— is the official language of the World Wide Web and was first conceived in 1990. HTML is a product of SGML (Standard Generalized Markup Language) which is a complex, technical specification describing markup languages, especially those used in electronic document exchange, document management, and document publishing. HTML was originally created to allow those who were not specialized in SGML to publish and exchange scientific and other technical documents. HTML especially facilitated this exchange by incorporating the ability to link documents electronically using hyperlinks. The biggest issue, in my opinion, is that HTML has become a lot more complicated than the initial design. Creating HTML content (particularly when used in conjunction with CSS frameworks like Bootstrap or Zurb or with applications that use additional semantic elements like ePub) takes a lot more than just knowing markup to code them correctly. It takes knowledge of the document structure, the semantics needed for the content or the applications we are creating and the restrictions and schemas that we need to use so that the content will pass validation. Perhaps the simplest solution when moving content from text to HTML is Markdown. Markdown is a text to (X)HTML conversion tool designed for writers. It refers both to the syntax used in the Markdown text files and the applications used to perform the conversion. The language was designed to be readable as-is, without all the additional tags and attributes that makes it possible to covert markdown to languages like SGML, XML and HTML. Markdown is a formatting syntax for text that can be read by humans and can be easily converted to HTML. The original implementation of Markdown is markdown.pl and has been implemented in several other languages as applications (Ruby Gems, NodeJS modules and Python packages). All versions of Markdown are distributed under open source licenses and are included or available as a plugin for, several content-management systems and text editors. Sites such as GitHub, Reddit, Diaspora, Stack Overflow, OpenStreetMap, and SourceForge use variants of Markdown to facilitate content creation and discussion between users. The biggest weakness of Markdown is the lack of a unified standard. The original Markdown language hasn’t been really supported since it was released in 2004 and all new version of Markdown, both parser and language specification have introduced not wholy compatible changes to Markdown. The lack of standard is also Markdown’s biggest strength. It means you can, like Github did, implement your own extensions to the Markdown syntax to acommodate your needs. Markdown is not easy to learn but once your fingers get used to the way we type the different elements it becomes much easier to work with as it is nothing more than inserting specific characters in a specific order to obtain the desired effect. Once you train yourself, it is also easy to read without having to convert it to HTML or any other language. Most modern text editors have support for Markdown either as part of the default installation or through plugins. I only discovered Asciidocs recently, while researching O’Reilly Media’s publishing toolchains. It caught my attention because of it’s structure, the expresiveness of the markup without being HTML like HTMLbook and the extensibility of the templating system that it uses behind the scenes. Asciidoctor has both a command line interface (CLI) and an API. The CLI is a drop-in replacement for the asciidoc command from the Standard python distribution. This means that you have a command line tool asciidoctor that will allow you to convert your marked documents without having to resort to a full blown application. Syntax-wise, Asciidoctor is progressively more complex as you implement more advanced features. In the first example below no tables are used, for example. Tables are used in the second and thirs examples both as data tables and for layout. The documentation provides more detailed instructions for the desired markup. O’Reilly Media has developed several new tools to get content from authors to readers. Atlas is their authoring tool, a web based application that allows you to create content they developed HTMLbook, a subset of HTML geared towards authoring and multi format publishing. Given O’Reilly’s history and association with open source publishing tools (they were an early adopter and promoter of Docbook and still use it for some of their publications) I found HTMLbook intriguing but not something to look at right away, as with many things you leave for later it fell off my radar. It wasn’t until I saw Sanders Kleinfeld’s (O’Reilly Media Director of Publishing Technologies) presentation at IDPF Book World conference (embedded below) that I decided to take a second look at HTMLbook and its ecosystem. If you use Atlas (O’Reilly’s authoring and publishing platform) you don’t have to worry about markup as the content is created visually. The challenges begin when implementing this vocabulary outside the Atlas environment. The project comes with a set of stylesheets to convert HTMLbook content to ePub, MOBI and PDF. The intriguing thing about the stylesheets is that they use CSS Paged Media stylesheets in conjunction with third party tools such as AntennaHouse, PrinceXML or their open source counterparts like XHTML2PDF or wkhtmltopdf. The open source solutions offer permisive licenses that allow modification and integration into other products without requiring you to release your project under the same license like GPL and LGPL. As with any solution that advocates creating HTML directly I have my reservations. In HTML formating in general and specialized formats like HTMLbooks in particular, the learning curve may be too steep for independent authors to use for creating content. 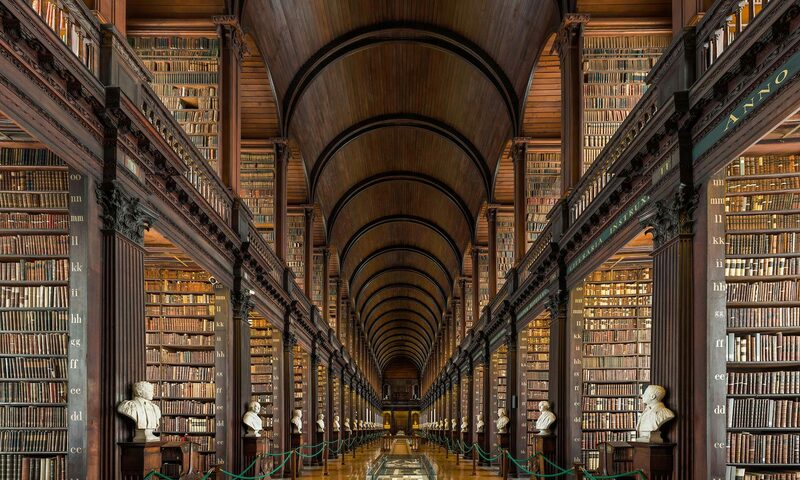 The user must learn not only the required HTML5 syntax but also the details regarding ePub semantic structure attributes and the other standards needed to create ePub books. While I understand that technologies such as this are not meant for independent authors or for poeple who are not comfortable or familiar with HTML but the learning curve may still be too steep for most users. Perhaps the oldest solutions in the book to create HTML without actually creating HTML are XML-based. Docbook, TEI and DITA all have stylesheets that will take the XML content and convert it to HTML, PDF, ePub and other more esoteric formats. In addition to stylesheets already available developers can create their own to adress specific needs. Furthermore, tools like OxygenXML Author (and I would assume other tools in the same category have a visual mode that allow users to write XML content, validated against a schema in a way that is more familiar to people not used to creating content with raw XML tools. The issues with xml are similar to those involved in creating HTML. The markup vocabulary requires brackets, attributes have to be enclosed in quotation marks and generall the syntax is as complicated as you make it. However, tools like Oxygen and smilar help alleviate this problem but don’t resolve it completely. 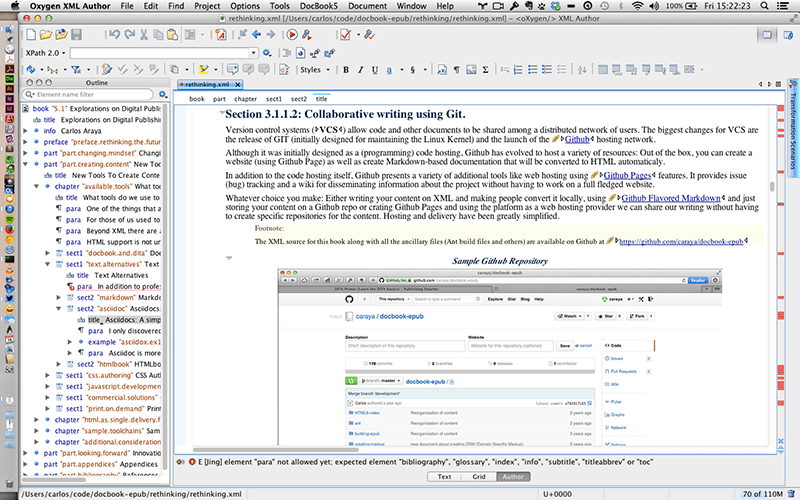 The screenshot below shows OxygenXML Author working in a Docbook 5 document using visual mode. The positive side is that using XSLT there is no limit to what we can do with our XML content. After exploring a selection of HTML conversion options the question becomes which one is best? The best way to see how can these text-based tools can be incorporated is to ask yourself how much work you want to do in the backend versus how much work do you want you authors to do when creating the content. This is where the value of specialists in digital formats and publishing becomes essential, we can work with clients in providing the best solution to meet their needs. Keep in mind who your audience and what the target vocabulary you’re working towards, it will dictate what your best strategy is. Are these all the solutions; definitely not. Other solutions may appear that fit your needs better than those presented here; I would love to hear if that is the case.